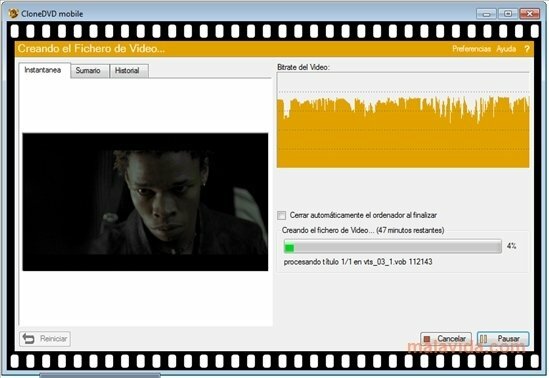 CloneDVD Mobile is a program with which you will have the possibility to rip any film in DVD format, one of the audiovisual distribution medium standards, to your computer, as well as converting the resulting files so that they can be viewed on any current portable device. The program has a great collection of presets that practically covers all the current gadgets, because it can convert any film so as to be played on PS3, PSP, iPhone/iPod, Nokia telephones, Creative Zen, Blackberry, Zune or Archos. One of the appeals of this application reside on how simple they are to handle, because it will only be necessary to input the corresponding disc, select the output format, choose a folder for the resulting files and wait for the program to perform its work. Another of the appealing things about the program lies in the fact that it allows the user to choose the audio channel and the subtitles that you want to use before starting to convert it. Thanks to CloneDVD Mobile you can discover one of the most intuitive tools to be able to take any film that you want wherever you want.